I recently stumbled upon this quote by a wellness and motivational speaker named Katrina Mayer and instantly I thought of it’s connection to my experience working at FISH. I see this supported every Friday morning I work at FISH. I see this supported at every Mobile Food Pantry. Where at 9 in the morning a smile and hello when passing out food or helping a 9 year old pick out awesome Spiderman cupcakes brings happiness and smiles right back at you. And I see this supported through all the giving and selfless volunteers at FISH. Small things go a long way. They matter. 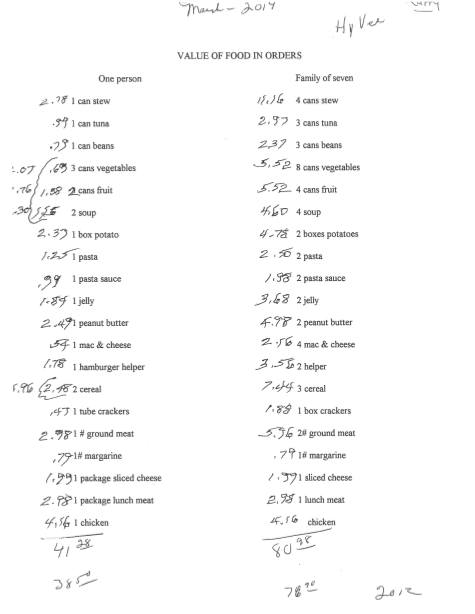 These are lists that consist of what we pass out to our clients here at FISH and the prices at our local Hyvee as of March 2014.